This reflection is from guest blogger Louise Hardman. Louise had written this for no other purpose than to share it with me, but I convinced her to let me share it with you. Thank you, Louise! Maundy Thursday. Late morning at St. Philip’s. With street people, mostly. Being washed, these folks unaccustomed to being served, waited on, perhaps even noticed at all. Reluctant to participate at first but loving “washers” slowly gathered them in. Others, like myself, brought coffee to them: we the servant not them. Unaccustomed to being touched, to simply being loved. It was a profound experience for some, like a dear man I will call “Joe.” Since I couldn’t bend to wash because of a back brace and he didn’t want to be washed, I asked if I could pray with him. He immediately responded. “Oh yes,” he said, “and pray for healing in my heart for my sister. We used to be close but there was the time she refused to take me in.” He mumbled something about drugs. His closest family, she had turned him down, out. He felt anger at her, and resentment. But he didn’t like feeling that way. “And I can’t forgive her. It is a heavy weight on my heart.” So we prayed, prayed that God would ease the turmoil in his heart, perhaps even help them to love again. I learned that he was a pro football player. With the San Diego Chargers. And that he wanted to learn to play the guitar. How fortuitous, then, that when he re-considered and agreed to have his feet washed, it was a dear sister with compassion in particular for the down and out who was his washer. And that she gave guitar lessons. And that “Joe” knew someone in her church! And so he sat on that metal chair in the parking lot, tears streaming down his face. I told him I’d stay with him and so I did, with another woman also touched by his tears. He said he’d never had someone wash his feet nor rub them with lotion before putting a pair if brand new socks on his now-cleansed feet. I left “Joe” and his washer talking about guitar lessons and how they could be in touch. “Joe” was Loved there in the parking lot at St. Philip’s. I myself was blessed. It all seemed the way of Jesus washing the dusty, road traveled feet of His disciples. A foot washing as Jesus would have had it. 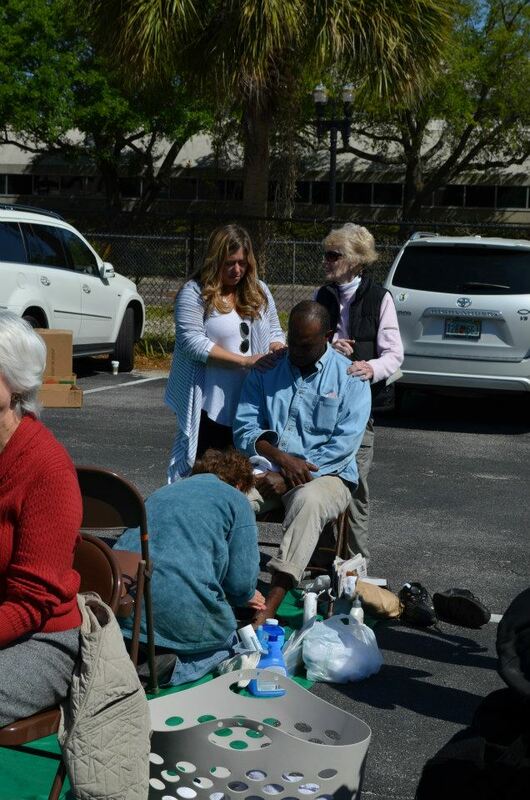 This entry was posted in Christianity, Diocese of Florida, Episcopal church, Ministry, peace, Recovery, Uncategorized, unity and tagged Christianity, church without walls, community, healing, holy ground, homelessness, hope, inner darkness, Maundy Thursday foot washing, mercy, radical hospitality, simple prayer, street ministry, vulnerability. Bookmark the permalink.